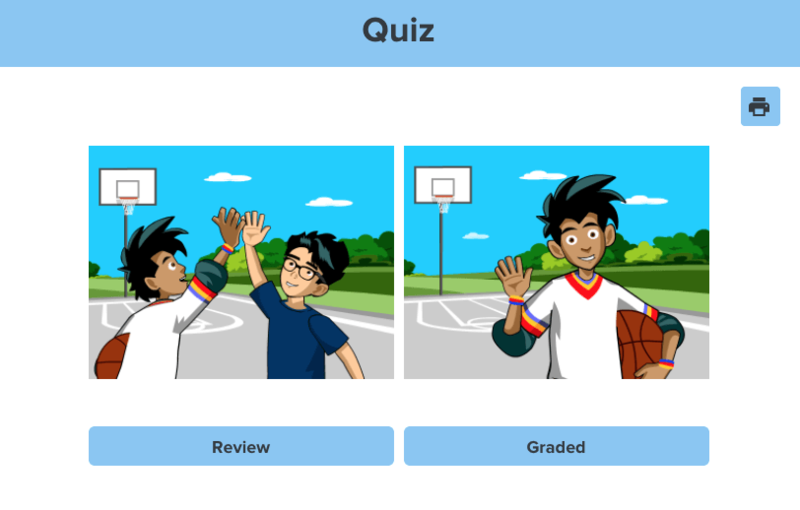 BrainPOP ELL quizzes are 10-question assessments that evaluate students’ understanding of the featured vocabulary, language, and content of associated lessons. BrainPOP ELL Quizzes offer both Review and Graded quiz options. The Review quiz only proceeds to the next question when the correct answer has been selected. The Graded quiz accepts a student’s first answer and reveals the score at the end of the quiz. Can students submit both Review and Graded quizzes to their teacher? Yes. Students with My BrainPOP accounts can submit both types of completed quizzes directly to their teacher in My BrainPOP. Review quiz scores reflect the number of initially correct responses. Can I create my own quiz? No. Currently only BrainPOP and BrainPOP Jr. users are able to create their own quizzes. Can quiz results be emailed? Yes. After finishing a quiz, students can choose Email Your Results. Students can also submit ELL quiz scores via My BrainPOP or print their results by clicking Print on the results page. Is there a way to view/print answer keys to BrainPOP ELL quizzes? No. As a workaround, you can take the quiz once in Graded mode and click Print when you’re done. The correct answers will be highlighted on the printed quiz.